Can i ask for some troubleshooting here?, my HS_slotID keep detecting unity files which already been deleted. I once made a backup named 00 -BACKUP.unity3d but its already being removed, but the software keep saying "00 -BACKUP.unity3d [ 359005 ] found in 00.unity3d"
Is there any some kind of history log in the game which recognize this so ican delete it to prevent it to keep showing? create a new local list "Tools > List > Create Local"
Hey, DillDoe, any chance we might see this work to change 6-digit IDs to 9-digits? I say this, because, the MoreSlotID mod has made this a viable option, now. yes, I've always planned to change it, but been pretty preoccupied lately to work on it. Hopefully I can find some time and get it done. Hello Dilldoe if you can kindly create a video tutorial on how to use this tool that will be a lot more useful as i am trying to change slot ids' i have too many conflicts and unfortunately i am unable to do so i do not know what i am doing wrong Thank You for Your consideration. Anyone know why a bunch of SAW's hairstyles are missing for me? I have MoreSlotIDs installed and I got rid of any conflicts with the mod, but any hair past slot 209399 simply isn't recognized. I can switch them around to get them loaded, though. Is there a max # of hair styles the game will load or something? Edit: So now the mapping moved it in 201XXX (back hair) now even though the file says 209XXX? I'm confused but I somehow fixed by removing the new conflicting mod. Apparently conflicts between the last 3 digits in the same slot types aren't being recognized. Edit2: Looks like HSConflictResolver was messing up the list, nevermind. Last edited by FishHead; 07-01-2017, 04:46 PM. I don't know if this is a right thread for bug reports, so, please, forgive me if I'm in the wrong one. 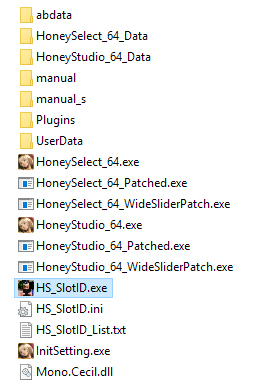 The bug is that the program won't work if path to honeyselect.exe contains whitespaces. For example, while my path was "D:\h\Honey Select", it did not work.when i fixed it to "d:\h\honselect", everything went according to plan. but "Sorry, your file is too large." The message is repeated continuously. I have entered all the correct ones in the empty boxes. I'm having issues with copying the .exe in the game folder, seems like my windows doesn't like me and gives me the "Destination Folder Access Denied" s***... Does any1 know how to fix it? I've tried it on the Admin account, changed the folder security settings to all possible outcomes and none works. I'm currently checking conflicts on newly-installed mods and I came across a strange (and new) issue. Ok, so far so good. Normally I just then locate the file, find unused ID slots and assign them to resolve the conflict. There's... 9 numbers. It's strange because each four of those conflicts do end with the proper numbers, I.E. 33 to 36, as reported by the list. But suffice to say that it went from detecting proper 6-digits slots to telling me that the actual slots are apparently composed of 9 digits now. I did try to manually change (assign) new ID slots from white, unused numbers in the Map report but even though I can change the actual ID slot number, once I click anywhere else or press enter the exact same 9 digit number comes back and replaces anything I would have done, it 'resets' itself back to those 9 digits, and the conflict remains. I'm at a total loss right now, does anyone have a solution to this? EDIT: Well, it looks like changing the 6 digits slot in the 'original' file instead (the one appearing to the left in the list) did the trick. I'm not sure if that's a recommended method to fix ID conflicts though, because it's a base file, I went in 00.unity3d instead of going in the mod's file, but in the end the conflict is gone; I'm assuming that's ok then (do correct me if I'm wrong on that though). EDIT #2: Apparently changing only the last 3 digits in those big 9 digits number also does the trick. I just encountered a conflict where BOTH files in the bottom list (the one listed on the right, and the one of the left of the same conflict) were 9 digits IDs. So I went in the left file listed (which was a mod anyway, not a base game file) and changed only the last 3 digits and it worked, the conflict is gone. Last edited by DeMolljok; 09-19-2017, 10:56 PM. Hi, DillDoe is it possible for you to release a 32 bit version? (or make it run in 32 bit?) I'm trying to run it through ModOrganizer and it won't load SlotID because it is a 32 bit program. I'm running 265 mods and would like to be able to check for slot conflicts. Last edited by ragonrox; 10-16-2017, 09:03 PM. People tend to be lazy and probably skip your post because of its length. Please use [spoiler]the whole error dump[/spoiler]. The editor has the empty button at the top right for this if you click the "A".